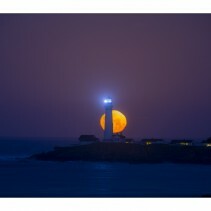 Home » Posts Tagged "full moon"
The full moon this month was setting right behind Pigeon Lighthouse near Davenport, CA. Usually when the full moon sets over this area, a strong marine layer of fog occludes the moon. Winter is when you get your best chance of clear weather and Sunday morning we were very lucky. There was fog but at a higher altitude, so when the moon went under the fog layer it was perfect. 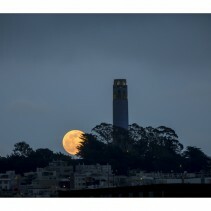 Last night was the full moon for the month of June. I was uncertain about the weather, summer being here, our friend Karl the fog is often present. 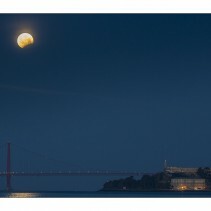 Exceptionally yesterday was a clear day and stayed clear in the evening. I went again at the same location as last month, looking for a better image. In photography, dedication and stubbornness are essential. 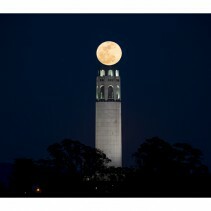 The major difference between this month and last, is the lighting of the Coit Tower. 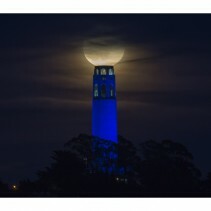 The city is celebrating its basketball team, the Golden State Warriors, playing in the NBA Finals for the first time in over 40 years. I had everything lined up but the fog came in to play the trouble-maker. It was late enough so I could get a couple of nice images.